#GivingTuesday is Tuesday, November 28. Find out more about this 24-hour, special opportunity to make 2X impact, click here. Hello, we are Yuki and Terry! We have been married for twelve years and met while we were graduate students. Seven years after our meeting, we married in Yuki’s home country of Japan. After our honeymoon in New York and Japan, we each took positions at Texas universities and have been active in our community for twelve years. Yuki expresses her love of learning and young people through her work as a professor. She received her master’s and doctoral degrees in education and urban studies. She is interested in raising students’ awareness of other cultures. Yuki enjoys travel be it local, domestic or international. Taking students abroad is a summertime tradition. We also visit Yuki’s family in Japan every summer. Yuki enjoys spending time with her family and having dinner with friends. Yuki believes in a strong mind and body and enjoys yoga. 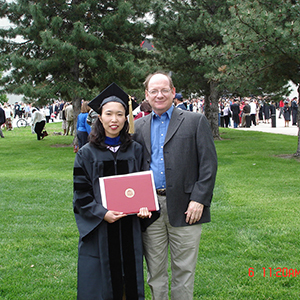 Terry’s career was in electrical design before finishing his master’s and doctoral degrees where he studied social psychology and leadership. As a professor, his interests are in the development of people and teaching them to understand each other and work together. He relaxes by taking on building projects now and then such as remodeling a bathroom, kitchen, building a deck or room addition for their home or another family member’s home. We each enjoy traveling together and experiencing different cultures. We enjoy taking in community festivals, being involved in community projects and elections, as well as cooking and gardening. We are actively involved in helping each other achieve their goals. We enjoy our families’ children and take an active role in their lives, education and welfare. We decided to adopt when we found we were unable to have children on our own and consider adopting much more than a logical next step in our relationship. Our families support our decision to adopt, as this child will be able to have their own place in our diverse family. We are looking forward as a couple and a family to sharing our love with this child! Help Upbring break the cycle of child abuse by empowering children, families and communities. Enter your email to download your report. At Upbring, we recognize that children enter the system at different stages of their lives and due to varying life events. Because the types of abuse and neglect vary among children, we are committed to raising the standards and addressing the entire spectrum. Upbring will accomplish this through an innovative continuum of services and community partnerships, each tracking progress against markers of safety, life skills, education, health and vocation, all of which are critical to breaking the cycle of child abuse. Health. We know that experiencing multiple traumatic childhood events – being removed from family – and toxic stress are determinants of lifelong disparities in physical and mental health. Access to high-quality, trauma-informed, integrated health care is critical. life jackets to portable cribs, childproof locks, bike helmets and more! Financial assistance/sliding scale available on car seats. Health. We know child maltreatment is linked to higher Body Mass Index (BMI), smoking and other health risks. Foster families are eligible to apply for financial assistance (based on individual locations). Join their team! The Y is hiring, with lots of flexible part-time opportunities! We know that foster care placement is 34 times higher for families experiencing homelessness than the general population of same aged children. We know that more than 1 in 5 youth who age out of foster care will become homeless after 18. Safe, affordable housing for families for individuals and at-risk/homeless families. Case management and supports in the areas of education, financial stability and health. A limited number of apartments for youth aging out of the foster care system in Upbring’s BeREAL program.